One part dragon, one part wise-cracking white haired guy. Hideki Kamiya isn't necessarily a name synonymous with co-op. The longtime game director is mostly known for fast-paced action games where a single instant can mean pulling off the sweetest 37-hit combo of all time, or getting knocked into a wall and then pounded into mush like a loser. 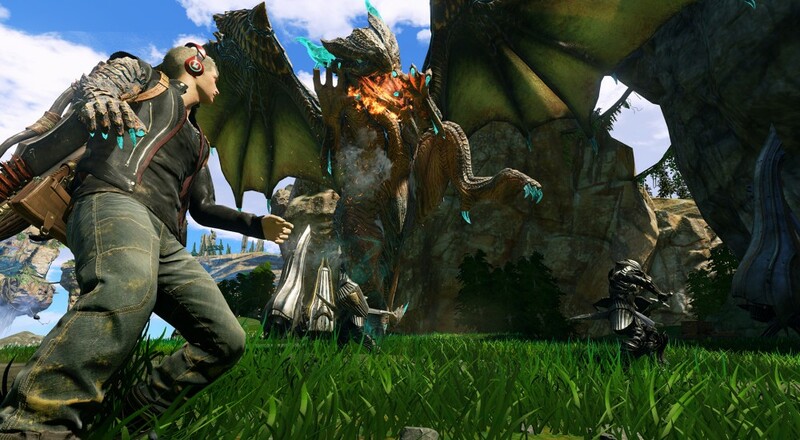 The revelation of his newest game, Scalebound having a four player co-op mode where you team up to wreck havoc on colossal monsters was a bit of a shocker, especially since it gave off a very distinct Monster Hunter vibe. Here to put those fears to rest is Hideki Kamiya himself, along with Scalebound's Game Designer, Yusuke Miyata. Our friends at IGN sat the duo down to ask about the new title, and together they aim to show off a bit of Scalebound's combat and illustrate the differences this Xbox One Exclusive possesses when compared to Kamiya's earlier work. The trailer focuses on the single player aspect, but here's hoping plenty of that bleeds into the co-operative missions as well. Drew (the Dante-esque hero of the campaign) can wield a vast arsenal of both melee and ranged weapons, and his dragon pal can go through some evolutionarily dubious upgrades as well. Finding the right weapon for your playstyle has been instrumental in plenty of Platinum's games, and that trend continues with Scalebound. Hopefully, we'll be able to customize Drew's perplexing headphones as well. It's hard for me to not draw comparisons to Monster Hunter, given that you and a cluster of friends will team up to slay some colossal monstrosity. Of course, you're also guiding your own beasties into the fray, and the traditionally deliberate MH action is jacked up with that Platinum Games adrenaline. Platinum hasn't announced Scalebound's release date just yet, so we'll be waiting a while longer to pit our dragons against other dragons. Page created in 1.4531 seconds.